WRIAs 25 and 26 are located in southwestern Washington, and include large portions of Lewis, Cowlitz, Skamania, and Wahkiakum counties. WRIA 25, known as the Grays-Elochoman watershed, encompasses the Grays and Elochoman Rivers, and Skamokawa, Abernathy, and Coal Creeks. 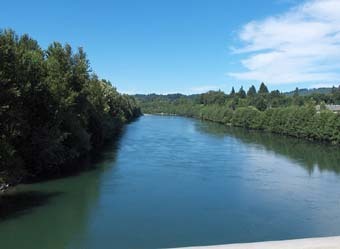 WRIA 26, designated as the Cowlitz watershed, includes the upper and lower Cowlitz Rivers, Cispus, Tilton, Toutle, and Coweeman Rivers, and Mayfield Dam. Both WRIAs include many subbasins that drain into the Columbia River, however, they do not encompass the Columbia River itself. WRIAs 25 & 26 are critical watersheds for fish – they include 24 subpopulations of salmon and steelhead listed under the ESA, more than anywhere else in the lower Columbia region. In addition, the Cowlitz basin is one of the most densely farmed areas of western Washington, and water is over-appropriated. A 2012 Department of Ecology Water Availability report for the Cowlitz watershed describes a need for further regulations to manage the basin’s water supply, including an instream flow rule as well as closing critical subbasins to future water withdrawals. The report also lists 17 river and creek basins that had been listed as “restricted” or “closed” to new uses as determined by the Department of Fish and Wildlife’s Surface Water Source Limitations. Although the Department of Ecology acknowledges the need for regulations in WRIAs 25 and 26, the rulemaking process has not been completed. The Lower Columbia Fish Recovery Board (LCFRB) began work on a joint watershed plan for the Grays-Elochoman and Cowlitz basins in 1999. In 2006, a draft of the plan was unanimously adopted by Wahkiakum, Skamania, Lewis, and Cowlitz counties. The 2006 plan recognized that climate change will impact streamflows, and determined that water usage was already beyond a sustainable level. Among the plan’s recommendations were instream flow rules for 10 rivers and streams, many closures of various subbasins, and the establishment of reservations in each basin to ensure an adequate water supply for future uses. In 2008, the LCFRB issued a Detailed Implementation Plan for WRIAS 25 and 26, and the Department of Ecology began the instream flow rulemaking process. In mid-2010, however, the rulemaking process was halted. The Department of Ecology provides two reasons for this on their website: “public concerns on the level of local participation, supply for rural water users in the Cowlitz watershed (WRIA 26), and ground well metering,” and “Gov. Gregoire’s Executive Orders 10-6 and 11-03, suspending non-critical rule development and adoption in 2011 and 2012.” In response to public concerns over the proposed water restrictions, particularly in the Cowlitz, the LCFRB released revisions for the WRIA 26 Cowlitz Watershed in 2014. While the 2006 plan recommended that all subbasins in the Cowlitz basin be closed to new groundwater withdrawals (save for reservations and domestic wells), the revised plan included the complete opening of the lower Cowlitz watershed to future withdrawals. In addition, Ecology agreed to remove the metering language from the plans to appease concerned residents. Despite the easing of the original plan’s water use restrictions (and the fact that both of Governor Gregoire’s Executive Orders cited by Ecology are long expired), there is still no instream flow rule for WRIAs 26 and 26. Especially in critical regions where water resources have been over-appropriated for years, setting regulations like instream flow rules cannot be delayed. CELP urges the Department of Ecology to follow up on its priority of setting instream flows for WRIAs 25 & 26 to ensure adequate water for people, farms, and fish in the Grays-Elochoman & Cowlitz basins. If you are interested in helping to secure protections for the Grays-Elochoman & Cowlitz watersheds, please email CELP at contact@celp.org.